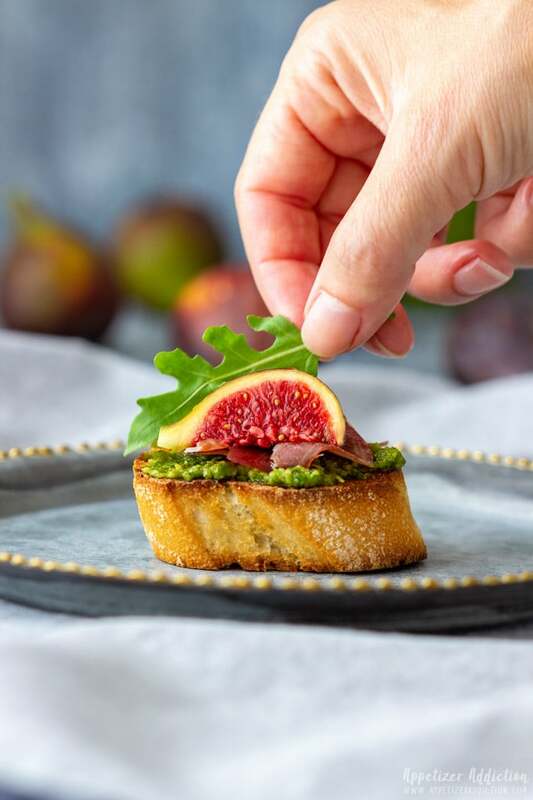 Prosciutto fig crostini toasts are flavorful little bites perfect for any occasion! 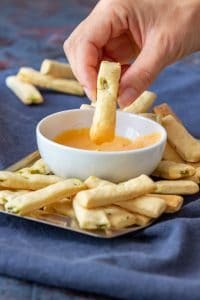 These bite-size appetizers are easy to make and take only minutes to put together. 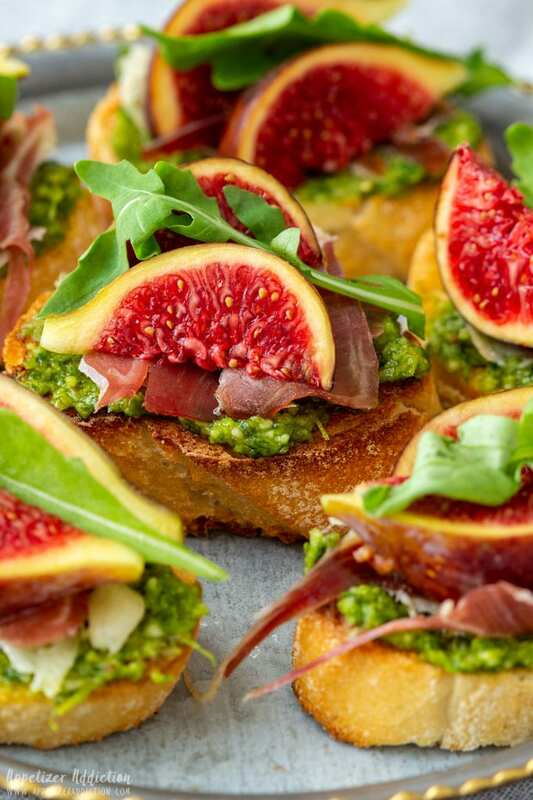 I used homemade parsley pesto as a spread for these Prosciutto fig crostini. You can use the classic basil pesto instead. Cut the baguette into thin slices. My preferred thickness is ½ inch – ¾ inch (1.5 cm-2 cm). I don’t recommend cutting them thicker than that. The reason is simple. You want to achieve a balance flavors and textures. As much as I love bread, too much of a dry toast would not go down well with me. Toast them. I use a toaster to do that. It’s quick and easy. If you want to use oven, then go for it. Alternatively, you could also buy ready-made crostini. Bear in mind that the shop-bought version is way crispier than the homemade crostini. Next thing to prep is the figs. Make sure to wash them thoroughly under running water first. Pat them dry with a paper kitchen towel and cut each into 8 piecies (into quarters first and then each quarter in half). 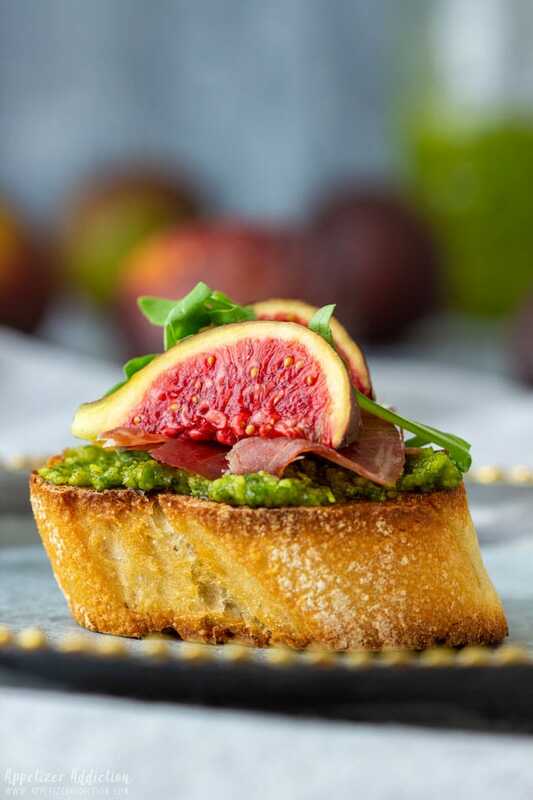 A slice of toast + green pesto + little piece of Parma ham + 2 pieces of a fig + arugula = Prosciutto fig crostini ready to be served! 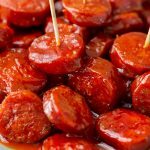 Parma ham a.k.a Prosciutto can be substituted with Spanish Jamon (7 things you need to know about Spanish ham is an interesting article explaining what it is and how it is served). If you don’t like arugula, feel free to omit it. 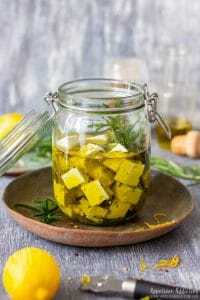 Green pesto is a delicious spread but you can also use a combination of goat cheese and ricotta instead (I used this spread to make Pear Goat Cheese Crostini link missing! French Baguette is the best for making crostini. However, if your local grocery store sells other long baguette-style breads (with seeds or wholemeal) you can use those as well. 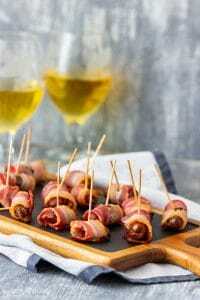 Even though you might think that this is an expensive appetizer, you only need 3 figs for 24 pieces. The same goes for Parma ham. 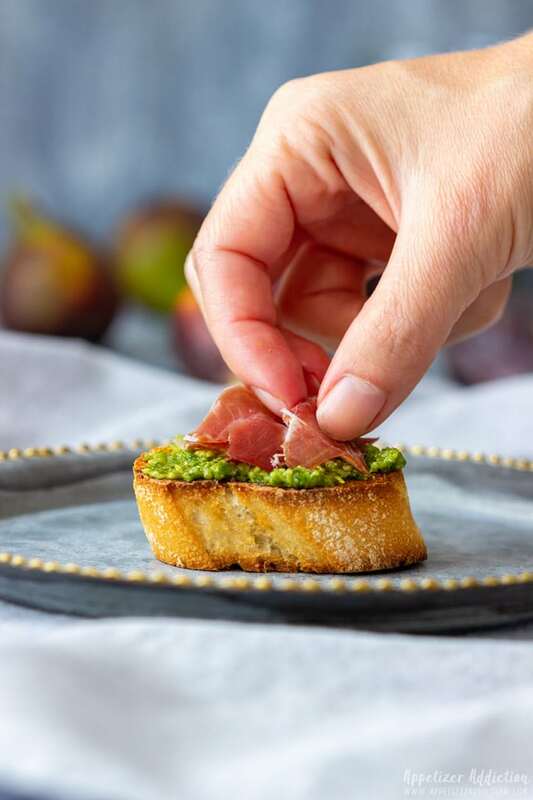 You only need a tiny piece per crostini. Guys, I hope you give these simple canapes a go. If you are not sure, try making only half portion (12 in this case). You can see if your guests like them or not. If they do, you can make them in larger batch the next time. 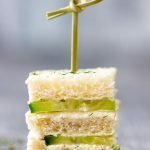 If not, you might like some other finger food ideas on my blog! It’s all about taste and also trial and error. Just experiment and you’ll see! Cut the bread into ½ inch (1.5 cm) slices. Put them in your toaster (try to fit as many as possible) and toast until they are brown and crispy. Meanwhile, wash the figs and pat them dry with a paper kitchen towel. Cut each one into 8 pieces (first into quarters starting from the stem area, then each quarter in half). 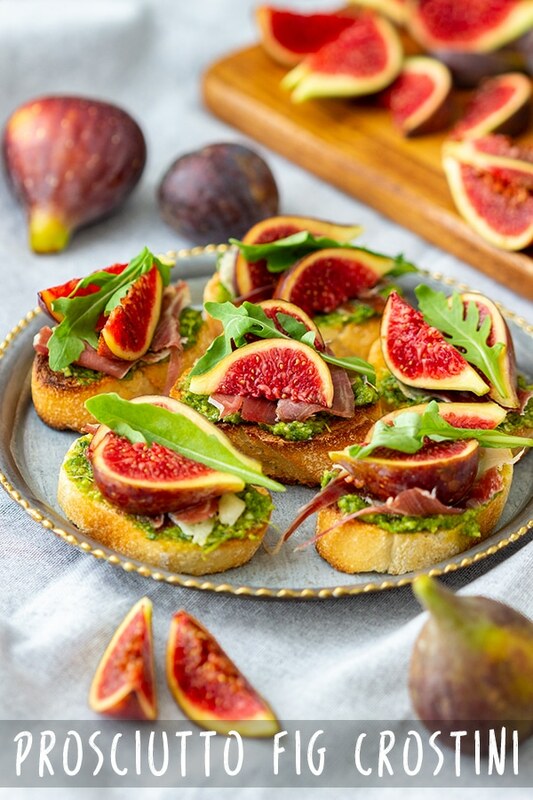 To assemble, take one crostini, spread about a teaspoon of pesto over, add a small piece of Parma ham, 2 pieces of fig and top it with arugula leaf. Repeat until you are done. I used one large baguette that was about 24 inch (60 cm) long. 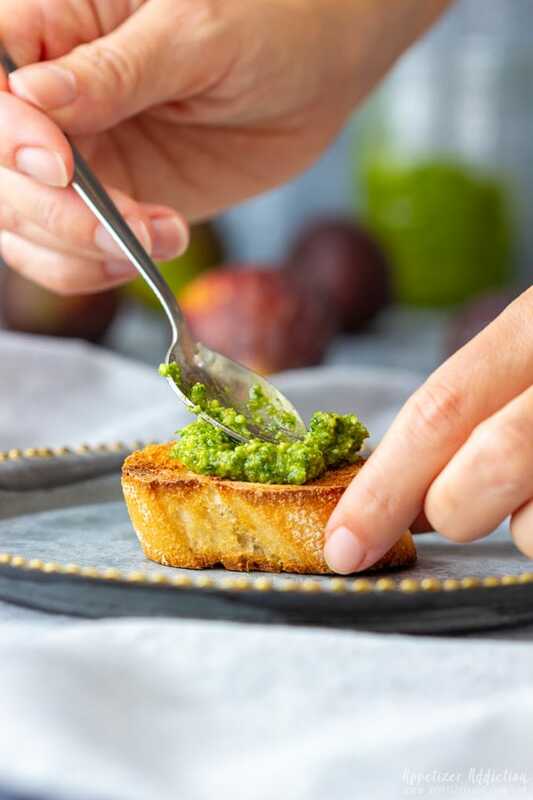 Use either shop-bought or homemade green pesto. Basil, parsley or arugula are all delicious options. The amount of ham you use may vary slightly. This will depend on the amount you put on each toast. I usually use only a little bit so it is not over-powering. These crostinis are best enjoyed right away but will last up to 4-5 hours. 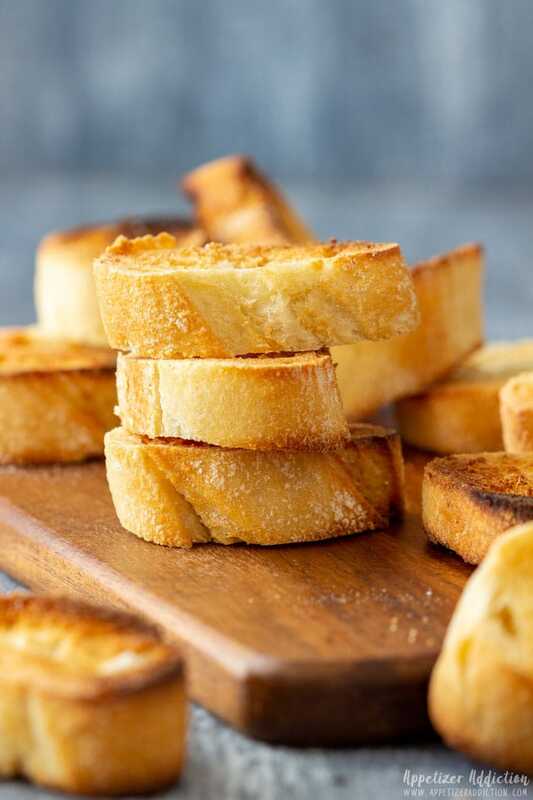 Just note that the crostini toasts will go slightly softer. Cooking time = toasting in the toaster! 24 pieces serve 6-8 people. This will depend on many factors: i.e. 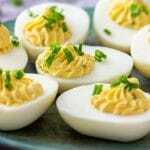 whether other foods will be served at the party, the type of party, what time of the day they are served, …. I’m loving all the colors and textures going on here. 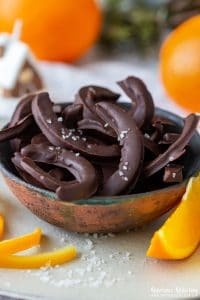 If these were served at a holiday party, I don’t think I would be able to stop eating them. Your photos are simply stunning! 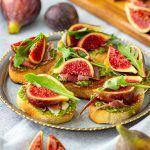 What a bright and gorgeous dish…these fig crostini are so elegant and I bet they are absolutely delicious! All I need is a glass of wine with one and I’m set. 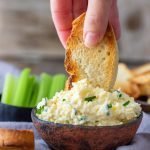 These photos and this recipe just blew me away! Stunning, absolutely stunning. 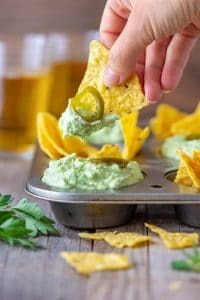 I’m in charge of the food for my future sister-in=laws bridal shower and this recipe is 100% being added to the spread! Did I mention this dish is stunning? That’s soo good to hear, Krista! These look wonderful. I love all the colors and all the flavors, especially the use of parsley pesto. 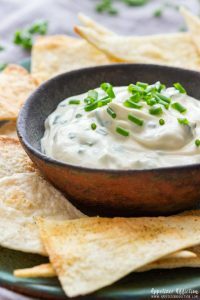 This is a perfect appetizer for Christmas! What a beautiful bite and the colors of those figs are impressive. 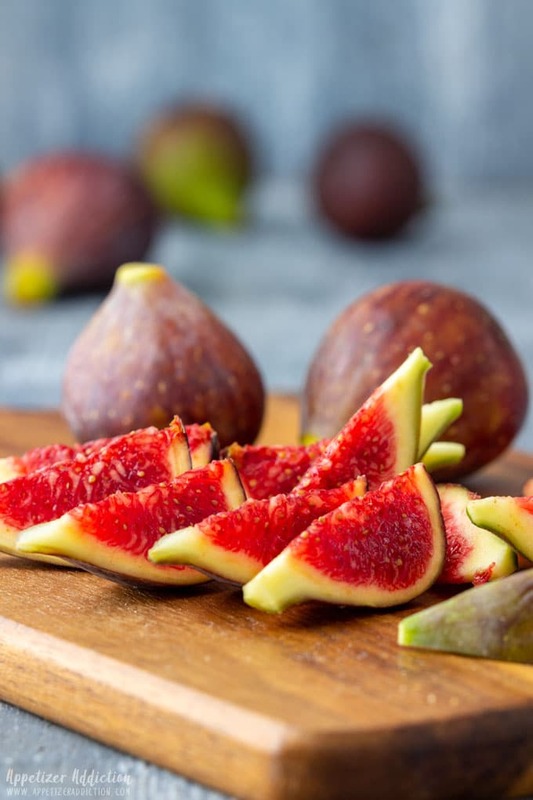 I am a lover of figs, but it is hard to find them in my market. I bet the prosciutto adds a very nice flavor too. Hope you give it a go if you do get your hands on the figs!